Please e-mail images to sales@reverie.ltd.uk of your damaged areas, a few close ups and some longer range shots together with sizes of components, sizes of damaged areas and approximate thickness of laminate where damaged, if known. Also please specify if you want the part prepared ready for colour coat or clear coat, or if you want it repainted by us in colour or clear coat or simply re polished. In order to provide you with a precise quote please provide as much information as possible. 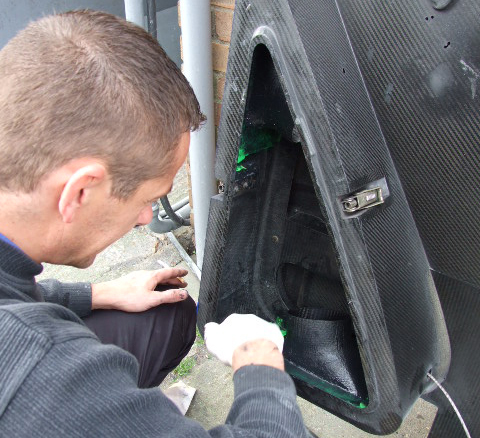 For more information on our repairs service, visit our Carbon Fibre Repair page. We are fully ISO9001 approved and undertake many complex wet laminated or pre-preg Carbon Fibre repairs at Reverie. Please e-mail images to sales@reverie.ltd.uk of your damaged areas a few close ups and some longer range shots together with sizes of components and sizes of damaged areas and approximate thickness of laminate where damaged if known. Also please specify if you want the part prepared ready for colour coat or clear coat or if you want it repainted by us in colour or clear coat or simply re polished.We have two surface tables and a 8ft by 15ft flat steel floor area to do precise repairs on your component be it Automotive, Motorsport, Marine or sports equipment. We can if required at additional cost also provide dimensional inspection reports from our FARO GAGE arm if required of the repaired component against original 3D CAD if available or we can measure another good part first and compare to that if required. Please contact us for some friendly expert help or no obligation quotation.